Members of the Co.R.E. Robotics team from Sandy Creek following a recent competition at Rochester Institute of Technology. Pictured left to right are: Hailey McNitt, Sadie Lurcock and Margery Yousey. This past weekend was a busy one for the Sandy Creek Robotics teams! First, the middle school teams attended their first competition at SUNY Oswego on Saturday. The novice teams made quite the showing placing 7th, 9th, and 16th out of 24 teams in skills. The J team was also awarded the Judges Award, which is presented to a team that deserves recognition but may not fit under other award categories. A special thank you to Hunter Aurelio, Hailey McNitt, and Sadie Lurcock for mentoring the middle school teams on Saturday. The high school robotics teams competed at RIT on Sunday. They also made an impressive showing, with all three teams making it to the quarterfinals. Additionally, the Y team placed third in skills, and is currently tenth in the state in skills. The R team was also awarded the Design Award. The Design Award recipient demonstrates the ability to implement the most effective and efficient robot design process. 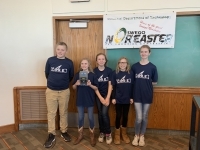 Their Engineering Notebook and discussion with the Judges will demonstrate the teams ability to produce a quality robot with minimal adult assistance. Only teams that submit Engineering Notebooks are eligible for the Design Award. Engineering Notebook is a clear, complete, and organized document of the robot design process. The robotics team would like to thank the administration, staff, and community for their continued support. Members of the middle school Co.R.E. Robotics team are pictured following a recent competition at SUNY Oswego. 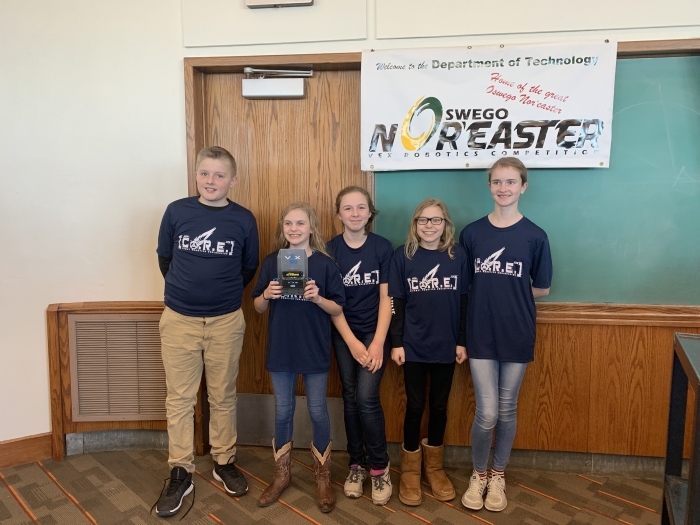 Left to right are: Braden Metott, Abagail Balcom, Piper Phillips, Sara Leppien and Sophie Harris.